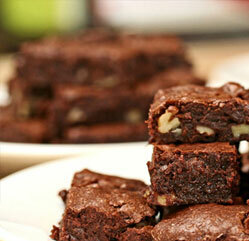 Buy Gourmet Brownies Online... Cookies and Biscotti Delivered To Your Door! We'll handle it all for you. Send us a list of the people you wish to thank with a special gift assortment from Ruth’s Brownie Kitchen and we’ll take it from there. We will do the packaging, gift-wrapping and drop-shipping to one person or a thousand or more. You can choose one of our standard gift package, or we will be happy to create a special gift package or tower that meets your budget and needs perfectly. Volume discounts do NOT apply to sale items. taste. They are made according to our own special recipes exclusively with Valrhona chocolates and other farm-fresh natural or organic ingredients.